The devPostgres service mentioned in the manifest file is the service instance of Postgres service that is create on SAP Cloud Platform. Target framework: In this blog, the target framework that is being referred is .Net core 1.1. The .Net framework 4.5 could also be used with the mono community buildpack, however, for the buildpack mentioned above, the target framework that can be used is .Net core 1.1. Visual Studio: The IDE that was used to develop the solution is Microsoft Visual Studio 2017. Ensure to download and install the relevant version/sku based on your requirement. Dotnet CLI: The dotnet core Command Line Interface is used for building .NET Core apps and libraries. We will use the published set of files to push the application using CF PUSH command in CF CLI tool. Entity Framework: Entity Framework is the ORM (Object/Relationship Mapping) framework that enables to map the relation data as domain-specific objects. The entity framework used in this solution is the Entity Framework core 1.1.2 which is the recent stable version at the time of writing this blog. The same can be downloaded to the visual studio solution using the NuGet package manager – Link. Data Provider: The data provider allows the programs written in C# to access the Postgres service on SAP Cloud Platform. The data provider that is used in this solution is Npgsql which is an open source ADO.NET Data Provider for Postgres. This can be downloaded through the NuGet Package manager – Link. The version used was 1.1.2 which was the latest stable version at the time of writing this blog. In the above connection string, if the pooling is set to true, for the transactions, the application shall use the DB connection that is already available. Without a connection pool, the application will reach out to the DB to establish a connection. 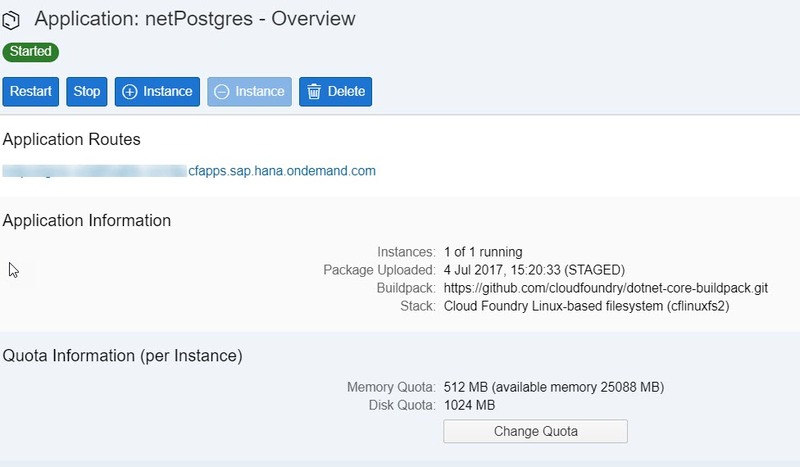 Once you create the Postgres Service Instance on SAP Cloud Platform and bind to the application, you can view these details in the dashboard of the service instance. The solution involves developing a Database context and creating an entity that contains the fields equivalent to the columns of the Postgres relation. Step 2: The next step is to create an interface for the Data Access Provider. This interface will hold the list of methods that are to implemented in the Data Access Provider class. The same will be used for registering in the startup.cs class. Step 3: A DbContext that contains the information about the entity to table mapping along with the properties of the columns in the table. The DB Context class can also be used to implement a Entity Framework shadow functionality which is beyond the scope of this blog. Step 4: Now, we are ready to implement the Data Access Provider interface. As an example, I have implemented just a couple of methods. Note that I have implemented the methods to add the user and retrieve all the records. Step 5: The penultimate step is to create a controller that offers the API service to retrieve and store the record. It is assumed that the relation ‘User’ already exists. Just in case you want to create the table instead of migrating from your older application/system, you can initialize the table using an API as shown below, by adding it in the same controller as above. Note to fill in the respective service credentials in the connection string. Step 6: The last step is to register the Data Provider in the startup.cs class in the configure services method. Since, we are deploying the application on to the Cloud Foundry, ensure that the respective stack is mentioned in the .csproj file. 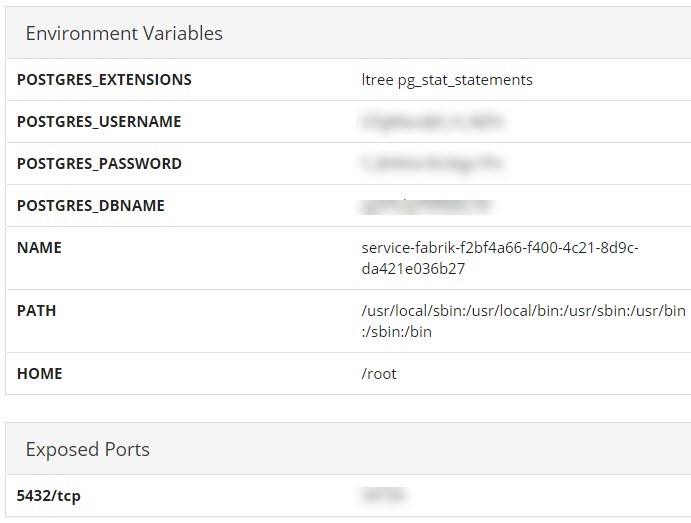 In my example, I have mentioned the Runtime identifier as Ubuntu 14.04 since the Cloud Foundry environment in SAP Cloud Platform uses cflinuxfs2 stack which is derived from Ubuntu 14.04 (Trusty Tahr). Now, the solution is ready to be built using dotnet CLI and deployed to SAP Cloud Platform. Ensure that you have the latest dotnet CLI tool by providing the command “dotnet –version” in the command prompt or Git bash or any other terminal of your choice. This command would display the version of the dotnet CLI used. Step 2: The next step before we can push the application is to publish the application. This is done using the dotnet publish command. Specify the necessary runtime and framework based on the SAP Cloud Platform. Note that this command will also prompt for any potential warning/error messages in the solution just as depicted in the above execution. Step 3: Use the Cloud Foundry CF CLI tool to push the application to SAP Cloud Platform. The command for the same would be “cf push -f manifest.yml -p /c/publish”. Note to specify the manifest file’s location and the location where the solution is published. For details on how a cf push would be executed, refer step 3 in the blog. Upon a successful deployment and application start, you will get the application URL in the CF CLI prompt or the SAP Cloud Platform cockpit in the application overview page. Note the buildpack and stack mentioned in the overview page just to confirm that you have used the right buildpack. I have used Postman tool as a Rest client to test my API services. For those who wants to create the relation in Postgres, you will be executing the GET method API call to create the User relation. The response is also displayed in the snapshot above. Next, we will add records to the created relation as shown in the Postman execution below, for which you will get a response as ‘0’ as per the code. Note that the Body of the POST request is being sent as form url encoded. Now to see the record created, execute the GET request as shown below. For the sake of simplicity, this blog showed how to create a .net core application to perform CRUD operation on Postgres service on SAP Cloud Platform. The same can be extended to a web form as well. A good one, great read! What does this tell us about the status of .Net Core on SAP Cloud? At the SMB Innnovation Conference in March 2017, the official word was that .Net Core was not supported or available. This post seems to indicate that it is at least available (via a CF community buildpack) if not supported. You got that right, Darren. .Net core is not officially supported. However, the CF community has .Net core buildpack to offer. This post just indicates the possibility of using it. This post has been of great help for me to familiarize with this topic. The controller class is named UserAPIController, which doesn’t match the URLs used within Postman ending with “…/api/user” within the testing section. Either the URL should be “…/api/userapi” or the controller class should be named UserController. The part creating the Model in the PostgreSqlContext class has also been problematic. I kept getting this runtime error message: “InvalidOperationException: Entity type ‘NetCore1Postgre.Models.Users’ is in shadow-state. A valid model requires all entity types to have corresponding CLR type.”. After some experimentation, when I completely commented out the OnModelCreating method, everything just worked fine. I’m not an expert, so I don’t know if this may be a consequence of using different framework versions: you mentioned v1.1 of ASP.NET Core here, while I’ve been using version 2.1, which is the current default with the built-in .Net Core buildpack of Cloud Foundry. Again, many thanks, this is great stuff! Thanks for reading the blog. Yes! You got it right. The current version has got quite some changes compared to the one I used at the time of this blog.